Care for Hair Survey Participate in the Care for Hair Survey to help us understand your hair care needs. Answer a few simple questions and you could win Rs 2000 gift vouchers. 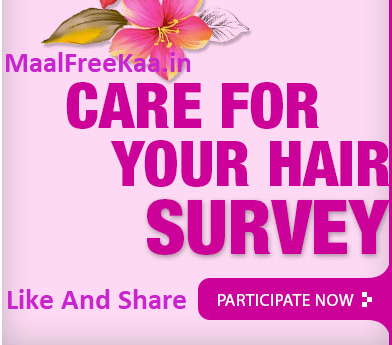 For participating in the survey ‘Care for Hair Survey , individuals need to answer all multiple choice questions MaalFreeKaa.in No. 1 Cashback & Offer Website providing best deal and freebie offer stay with us and grab awesome deal only here. Website in News Media About All Online e-Commerce News Update. You Grab Daily Awesome Freebie Product or Prize When you Play our Publish Online Giveaway and Free Sample Claim. Now We Leading Page in IPL 2018 Contest You Can Play IPL Contest and Get Free Official IPL Team Jerseys, T-Shirt IPL Match Tickets, Top 5 IPL Player Ranking And Much More. 5 winners, for the duration of the survey, will be entitled to an gift vouchers worth Rs 2000/- each. The winners will be chosen at random out of the pool of participants who submit a valid entry i.e. have answered all the questions. P&G will announce the names of the winners from the pool of participants who submit a valid entry. 5 participants will stand a chance to win gift card worth Rs 2000/- each. 18. 5 Winners will be announced on 25th May 2018.